Well, friends... the time is here!!! As I'm flipping the pages of my planner and filling in dates, I'm realizing that the Holiday season will be here sooner rather than later which means it's time for my FAVORITE part of the year... Christmas Cards!!! There are only 102 sleeps until Christmas!!! All of my cards are double sided and are professionally printed on the highest quality card stock with either a pearl, linen or flat finish. They come with gold lined, silver lined or kraft envelopes and are delivered to you directly from my printing service via UPS overnight. The first set of 25 cards and envelopes are $45 and additional sets of 25 are $40. Shipping is a flat $7 rate. This is a separate email address I created just for cards to help me stay organized and keep track of everyone's photos and information. When I receive your email, I'll send you an invoice for $52 ($45 for one set of cards and envelopes and $7 for shipping). If you are going to want more cards than a set of 25, I'll send you a second invoice after you receive your proof. Once you pay your invoice, I'll send you an email with details on what I need from you (photos, text preferences, aesthetic input,etc) and once I receive the information back from you my typical turnaround time for a proof is 72 hours. I'll email you a proof, we'll make adjustments and as soon as the final proof is approved by you (and a second invoice is paid if you're wanting additional sets of cards) I'll place the order and they'll be to you within 2 business days. If you're interested in a design only (one that you can print on your own and/or share on social media) or any other type of service, please just note that in your email. I try my best to accommodate any and all requests and have done Christmas letter inserts, recipe card inserts, birth announcement/Christmas card combos, post cards, magnets and Christmas cards for businesses. I'm starting on cards now and will be accepting clients until I get too crazy busy (hahaha), so send me an email to receive/pay an invoice to reserve your spot on the list. 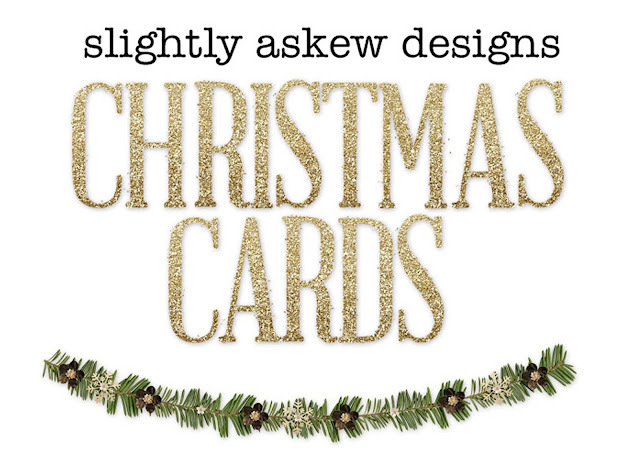 I have so much fun creating special cards for y'all and get such a kick thinking about how many Slightly Askew cards are arriving in mailboxes every season. Please don't hesitate to ask me any questions you have at the above email address as well. I hope you're feeling as festive as I am today! Happy Tuesday, friends! With our temps of like 475 degrees daily it's hard for me to even think of the holidays! But I'm definitely looking forward to them!!! I know!!! Hopefully it starts cooling off for you soon! I'm emailing you NOW to get my name on the list! I am dying over that blanket, & I just submitted my wish list!! Oh Matilda Jane gets me every time!! Right?!?! That was my favorite print from this season and I was GIDDY when I saw the blanket! I was just thinking about this yesterday!!! YAY!!! People are starting to think about Fall pics so I figured it was time! You did our cards last year, and I've been waiting for this post! I can't wait for you to design them again. Plus, the printing quality is top notch! This makes me so happy!!! I'm so glad you enjoyed your cards!!! Your cards are beautiful!! And I always love your Christmas decor! CHRISTMAS!! I am so excited! Hooray for Christmas!!!! I can't wait to see how you decorate your new house this year! EEK. I'm already a teeny bit overwhelmed... but I have some fun plans! when will you respond to the emails? I sent mine but I want to make sure you received it so I don't miss out on the awesome cards !!! Oh jeez we need to get a picture soon!!! I absolutely love your designs! Hey, I see my card! :) You do the BEST job! Emailing now. We have received SO MANY compliments on our cards you have done the last couple of years. Have you sent out your invoices yet? I couldn't remember how quickly you sent them out last year. There's no rush...I am just making sure my email got to you (I had a few computer issues the day you wrote this post and I sent you an e-mail). Thank you! 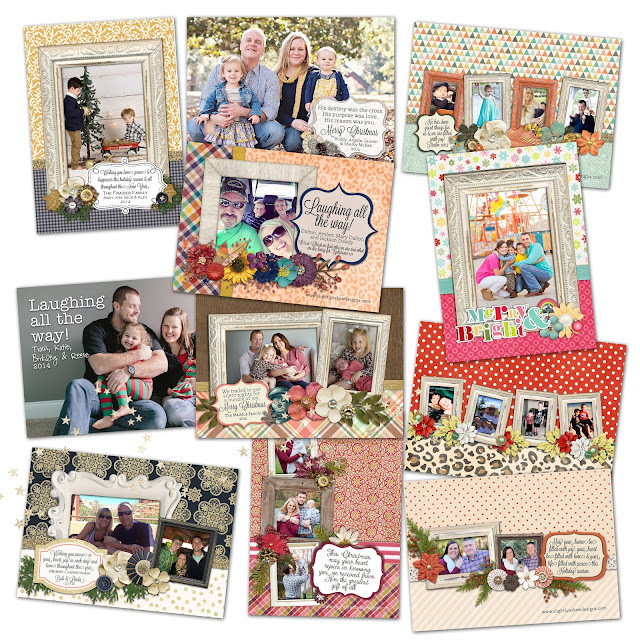 Are you still accepting Christmas card requests? I sent an email but haven't heard anything yet. Thanks!